last month in Malaysia. The purpose I was getting this pair of H900S walkie talkie is mainly for my own family use. During the evening, I normally having a swimming session and playing with my children while my wife is preparing for family dinner. She used to come down and looking for us after the meal is prepared. With the walkie talkie, she can get hold with us immediately without any hassle where we are as long as we are still in the housing compound. Walkie talkie is a radio communication system communicate with PPT (Push-to-Talk) function. Which means you can push the talk-button and immediately carry out the talking. The communication signal will immediately transmitted to the receiver within fraction of the second. As long as 2 units or more walkie talkie are set at the same frequency channel, the communication message will be delivered. This is th reason I was getting walkie talkie for our family close-distance communication. 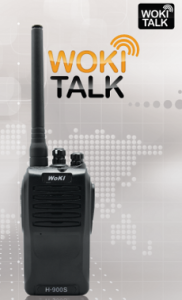 The WOKI TALK H900S walkie talkie come with a simple design left with sufficient features and functions. There are no additional button on the body so that the appearance is very neat and nice. The H900S walkie comes with 2 rotation knob, the first knob is the on-off and volume knob, whereby the second knob is for channel selection. There are total 16 channels for H900S. I use channel-5 for my application. Hopefully there are no other user occupy the same frequency within our coverage zone, else our communication will be broadcasted. The PPT button is located at the side of the body, it is eco-friendly while pressing the PPT button and do the talking. Signal transmission capability or distance coverage is one of the main key consideration while I am selecting this H900S model walkie talkie. Similar walkie talkie price range only giving the power of 3W whereby H900S power is at 5W. The power of the walkie determine the signal transmitting coverage area. I have tested with H900S, the walkie talkie signal range coverage reach 3km. Voice quality is clear while we are within the effective coverage area, however the voice quality will deteriorate while we reach marginal distance zone. But I may get extra several hundred meter if I pull out the extension antenna. This is the best part for getting the 2 way radio unit with an extension antenna. However there are several walkie talkie accessories we can consider, such as headset, walkie talkie casing bag, extendable antenna and hand-held microphone. During my purchase, I am exchanging the classic antenna to extendable antenna by paying the extra difference charges. Headset and hand-held microphone could be my mandatory choice if I am carry this unit for outbound activities or hiking. Since I am using this within my leaving compound, I do not purchase these 2 accessories. I will write more about the walkie talkie review after I am more friendly to the unit.